If you haven't had your eyes examined within the last two years, schedule an appointment now. 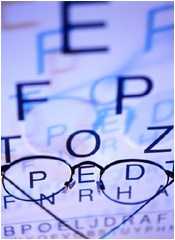 Routine exams are quick and painless and the only way to en sure good, healthy vision. We use the latest technologically advanced instrumentation to achieve pin point accurate eye exams. Next we will check your vision. One in four children ages 5 to 12 has an undiagnosed vision problem that may affect their educational performance. Unfortunately, children with vision problems often have no way of knowing that what they are seeing is different than what others see. It is up to the adults in their life to help children reach their potential by ensuring that they are free of vision problems. All children should have their eyes examined at or before their fourth birthday. If there is a family history of misaligned eyes, childhood cataracts or a serious eye disease, children should have their eyes examined before age three. Vision problems often respond to treatment better during the growth and development of a child's visual system, so early detection could be the key to good vision. There is no better time than now to start the habit of regular eye exams for you and your family. If you haven't had an exam within the last two years, schedule one now. During your exam, your eye care professional will help set a regular schedule for future exams tailored to your personal situation.